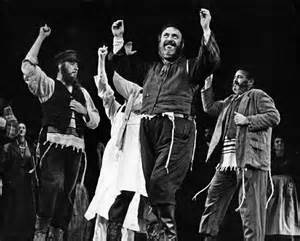 If Broadway lyricist Sheldon Harnick only wrote Fiddler on the Roof, he would have earned a major place in the annals of musical theater. In fact, he is credited with almost two dozen shows, often collaborating with composer Jerry Bock, on such titles as Fiorello!, She Loves Me, The Apple Tree and The Rothschilds. This is a milestone year for Harnick. Late last month, he turned 90, and this September will be the 50th anniversary of the New York opening of Fiddler. In celebration of his career, a new retrospective CD, Sheldon Harnick, Hidden Treasures: 1949-2013, two discs of material from his little-known shows as well as cut songs from his beloved musicals, has been released by Harbinger Records. 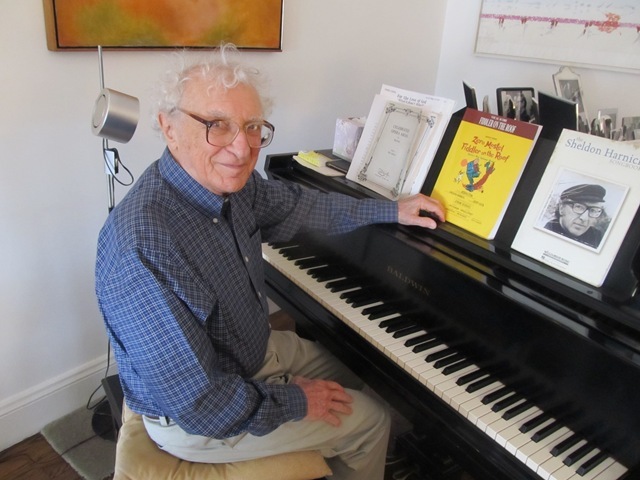 Recently, Hap Erstein sat down with Harnick in his Upper West Side apartment to discuss his career. The freewheeling conversation covered his thoughts on turning 90, how his partnership with Bock began and abruptly fell apart, how Fiddler on the Roof almost died in Detroit before Broadway, the friction between Jerome Robbins and Zero Mostel, the shortcomings of the most recent Broadway revival of Fiddler and plans for another one next season. Erstein: Do you have a favorite song on the new retrospective album? Harnick: The one that I got such a kick out of listening to again was from Fiorello! When we were in New Haven, we still had a scene in which we used the song (“What to Do) ’Til the Bootlegger Comes.” When I listen to that song, Jerry Bock’s music is wonderfully raunchy and funny. And the lyric, I had to keep finding rhymes for “comes,” and I found them. “Plums,” “drums,” “rums.’’ I was very proud of it and it’s a funny song. I just listened to it and I grinned from ear to ear. Erstein: What does turning 90 mean to you? Harnick: When I really think about it, then I realize that within 5 or 10 years I will no longer be here. So it’s a reminder that whatever I want to do, I damn well better discipline myself to do it, because I won’t have that much time. 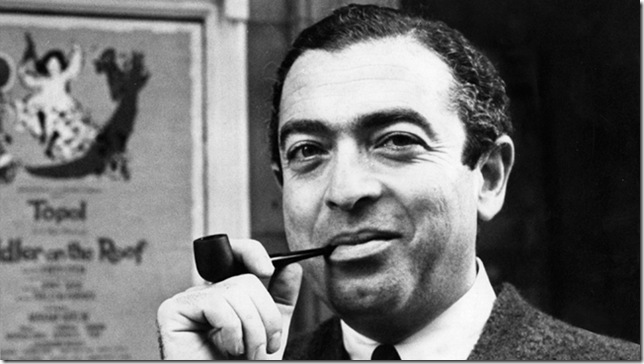 (Fiddler’s book writer) Joe Stein lived, I believe, ’til he was 98. He was, like me, energetic and compos mentis right up until the end. Erstein: Do you have a regular work regimen, a schedule? Harnick: No, I’m not well-disciplined in that way. But I do try to work every day. The hours may change. There are so many family things that I have to do. I try to get them done in the mornings and then from about 1 to 5 or 1 to 4, I’ll work on a show. Erstein: At the beginning of your career, you started by writing music. Why did you then gravitate to becoming a lyricist? Eventually, I had been called out of town to try to help with the lyrics to Shangri-La. 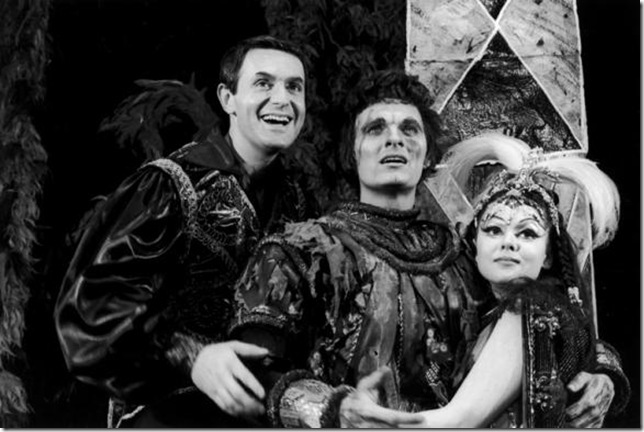 One of the people in that show was Jack Cassidy. And Jack said, ‘I want you to meet my dear friend, Jerry Bock, who has just split with his lyricist.” So that’s when I met Jerry and we hit it off. And since Yip had said, “Be prepared to work with other composers,” that’s what I did. Erstein: It is all hard work, but do you find lyrics easier to write than music? Harnick: Composing is very difficult for me because I’m not a pianist. When I first started to compose seriously and I tried to write maybe not complex accompaniments but rich, full accompaniments, what I discovered was I was making them so rich they competed with the lyrics. I remember the first time I had somebody sing one of these, I thought, “My God, you can hardly hear the lyric, there’s so much going on in the music.” So little by little, I had to learn how to do that. Erstein: What was it about Bock and yourself that meshed so well professionally? Harnick: One of the things, I find that I tend to be apprehensive when I work. I run scared. So I love to work with composers who are very outgoing and confident and ebullient, and Jerry was all of that. So was Joe Raposo, who I worked with for a while (A Wonderful Life). But also we had the same sense of humor. We had to learn how to work together. When we first started working on The Body Beautiful [their first show], I remember I had given Jerry a lyric that I saw musically one way and Jerry saw it another way and we got in a huge fight. We were screaming at each other. We were at his studio out in New Rochelle and finally we said “Let’s knock it off” and I went home. 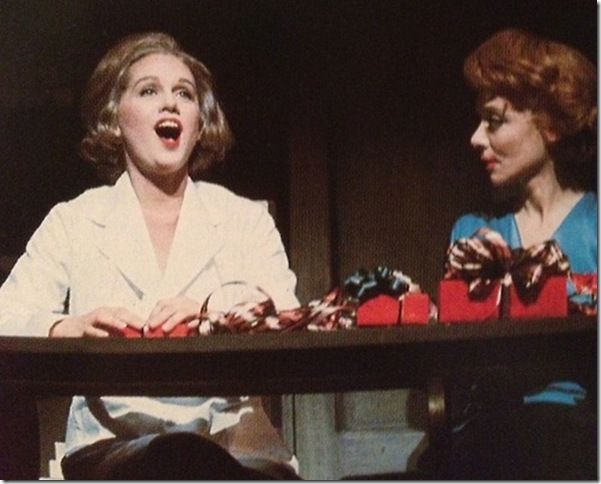 Erstein: You once called She Loves Me your “most satisfying theater journey.” Explain. Harnick: Yeah, well that’s because we all of us loved the show. We loved all the characters, including the villain. It was a wonderful experience writing the show. And then we opened and we got good reviews. So we thought, “Good, we’re going to be here for a year or two.” And within six months, business began to fall off. We had many post mortems to figure out what is wrong with the show, why aren’t people buying it? We never did figure it out, but it closed after about eight-and-a-half months, at a total loss of its investment. Erstein: What is your view now of why it did not run long initially? Harnick: Other people have said that it came in a year when there were these big hits, big flashy shows like Hello, Dolly! and others. When Time magazine reviewed us, they called it “the quiet one.” Actually, when we had these post-mortem, my argument was “’She Loves Me’ is caviar” and the reason it works well in summer stock is that the runs are rarely more than five weeks. After that, people who like a certain kind of musical, they’re not interested in She Loves Me. Erstein: So there are five weeks’ worth of caviar lovers? Erstein: Fiddler on the Roof is by far your most produced, most successful show. But its road to Broadway was rocky, wasn’t it? Harnick: Yeah. We went to Detroit knowing that we could die there, because Hal Prince had told us we’re going into the Fisher Theatre in Detroit and we have to be there for five weeks, that was the contract. But we only have a subscription for three-and-a-half weeks. So we get to Detroit and there’s a newspaper strike. So there were no reviews. There were one or two radio reviews. So we were scared to death. 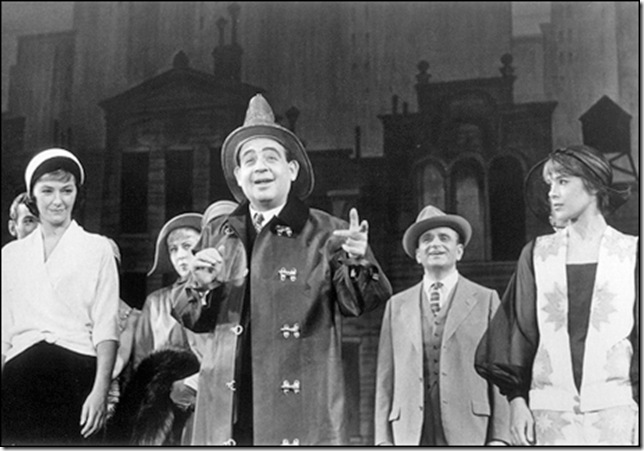 And Austin Pendleton (the original cast’s Motel the tailor) asked Jerry Robbins, ‘What are you going to do?” He said, “Every day we’ll fix three things.” And he did. Erstein: What did Robbins do? Erstein: Other significant changes out-of-town? Erstein: Robbins and Zero Mostel had been on opposite sides during the House Un-American Activities Committee hearings, with Robbins cooperating and naming names. Fiddler was the first time they worked together since then. Was that tense? The first day, the so-called “meet and greet,” the cast is there, Zero is there, we’re waiting for Jerry Robbins. Robbins walks in and Zero says, “Hi there, blabbermouth.” And luckily Robbins broke up like everybody else did. He laughed. Erstein: What was it you captured in Fiddler? It seems so personal and so universal at the same time. Harnick: I think it’s because it’s about family. Almost every family has to face the problem that the parents have certain values which may not be shared by the children. And for the children to break away and go sometimes in directions that are anathema to the parents, it’s a very difficult thing to deal with. At best, parent-children relationships can be difficult and so there’s a lot to identify with in this. The other thing is Robbins was the right director and he kept after all of us. I don’t know that he ever said the words, “It’s not good enough,” but we knew that’s what he was saying, so we rewrote and rewrote and rewrote and consequently, it’s a wonderful score and a wonderful book, which helps to make it a wonderful show. But I think what it’s about — coming to terms with what your children have done, and when a child does something unforgivable and you’re able to forgive her out of love — it’s a very powerful and very moving thing. Erstein: Let’s talk about The Rothschilds. Wasn’t that the straw that broke the Bock-Harnick team? Harnick: We had a director — Derek Goldby — and Jerry and he became very close. When we were on the road, those of us that weren’t that close to Derek realized that he had lost control of the show. He didn’t have the experience to do that big of a show. 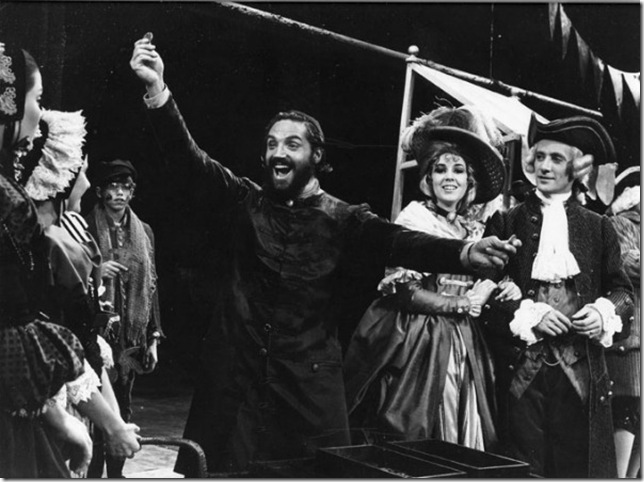 He had never done a musical, but he had done a show that looked like a musical — Rosencrantz and Guildenstern Are Dead — which with all its scene changes looked like a musical. He was just out of his depth and we realized he had to be replaced. Erstein: Despite your early understanding to not take work disagreements personally, I gather that you and Jerry did not talk for many years after this. Harnick: It was very difficult at first, but we had to talk because we had shows that were being revived. We had to talk about them. The first thing that happened I think was Goodspeed did a revival of Fiorello! and we knew that shows done at Goodspeed sometimes go to New York. So we made ourselves part of the rehearsal period. Being with Jerry and rehearsing Fiorello! brought back a lot of wonderful memories, so that was the first step towards renewing our friendship. Then the same thing happened with the She Loves Me revival and eventually we became friends again. But by that time, Jerry was realizing an old dream. Jerry’s a good lyricist, and he had always wanted to do his own lyrics. Erstein: But you two did write a new song, “Topsy Turvy,” for the revival of Fiddler. Was that like old times again? The song we wrote, it’s funny, when we finished the song we auditioned it for the entire company and they cheered. And we thought, “Thank God, we have a winner here.” And Joe Stein said, “I hate to say this but the song is not that good.” It always kind of semi-worked. Erstein: I love Fiddler on the Roof, but I was no fan of that revival. Harnick: I wasn’t, either. When David Leveaux showed us the set, we were so eager to have something different, we looked at it and went, “Wonderful!” Then when we saw the show on the stage, the opening number was fine and then in previews I realized that we lost the audience for about 15 minutes before we got them back. I thought, “Why is that?” Then it dawned on me. We should have a claustrophobic little house where everything takes place. Instead, we had this whole big stage. It looked like an estate. Erstein: Tell me about the upcoming revival of Fiddler, scheduled for next season to mark the show’s 50th anniversary. Harnick: Originally, we were supposed to have Mike Nichols (directing). When Jerry and I worked with Mike on The Apple Tree, he kept saying, “I shouldn’t be doing this. I don’t know how to do a musical.” And we kept saying, “Mike, what you’re doing is wonderful.” And he refused to believe it. And in fact, shortly before we came to New York, he called Jerry Robbins. Robbins came up to see the show and Robbins said, “Can you stay out another two weeks? I see a lot of things we could do.” And Nichols said, “No, with Barbara Harris, she’s very fragile. If we don’t come in soon, we won’t have a leading lady.” So Robbins said, “OK, then do this, this, this and this,” and Mike just wrote those things down and did them. When he did Spamalot and won the Tony, I thought, “Now he’s confident.” It turned out he wasn’t. When I wrote to him and said, “Would you do Fiddler?” and he answered me and said, “yes,” what I didn’t know is he told our producer, “I will only do it if I can do it with Casey Nicholaw [his Spamalot choreographer].” And Nicholaw wasn’t interested, so he backed out. At that point, we made a list of directors and Joe Stein’s widow and I wanted Bart Sher. He said he would love to do it, but he couldn’t do it in the anniversary year, it would have to be the year after because he was so busy. And I must say the lawyers and the agents were battling with us. They said, “Don’t use him. He’ll back out. Do it in the anniversary year.” And we held out for Bart, because I think he’s wonderful. (What is planned for your birthday celebration?) It’s mostly having to do with Fiddler’s 50th. They’re including me in it. The Folksbiene, the Yiddish theater, they’re doing a big, ambitious event at Town Hall (June 9). They’re trying to get in touch with as many people as they can that have done the show on Broadway. Because that’s what they did for Les Miz. Then Symphony Space, up on the Upper West Side, they’re doing a big gala. And Goodspeed is having a big celebration (June 14). What I intend to say at each one of them is how important Jerry Robbins was, because the more I look at that show, the more I realize it’s what it is because of Jerry Robbins. We knew from the beginning that he was obsessed. He said the reason he accepted the invitation to direct it, when he was six his family went to Poland — the area where we all come from — and he said even at the age of six, he remembers it as being a very moving experience. Now, he said, he has the chance to put that culture back onstage, to bring it back to life. And that is exactly what he did.